What Is The Butterfly Effect of Content Merchandising? If you think the butterfly effect only pertains to chaos theory, and has nothing to do with content merchandising, think again. Just as the flutter of a Morpho achilles in Brazil can lead to a tornado in Texas, poorly written, inaccurate introductions in your Amazon.com product-page content can create a storm of confusion in Tennessee and lead to poor sales. If you’ve got a good product with good sales potential, tens of thousands of sites will steal your product content verbatim and make it available to millions of eyeballs. The content that gets stolen is generally from your website, Amazon.com, or another high-profile retail site. While some of these plagiarizers are reputable companies, the vast majority of them are referral or affiliate sites that want a nickel or two from your online sales. Most of those refer eyeballs and sales to Amazon, but any e-commerce site with an affiliate program will do. The greedier of the bunch may lift the entire product description, but many will settle for the first few sentences. With the help of your content and their SEO strategies, these sites attract eyeballs and redirect customers to Amazon where the sale takes place. You get a sale, and the sites get a percentage of sales they refer. This WILL happen without your permission and is totally outside of your control. So accept it and use it to your advantage. If sites are willing to spread your product information to millions of potential customers for free, simply take advantage of that exposure and make sure they are spreading well-written, accurate information that you fully control. Copy/paste the first sentence of virtually any product description from your site, Amazon.com, or any top-tier e-commerce site that carries your product. Put the passage in quotation marks and Google it. Wait about 1 second and see what happens. 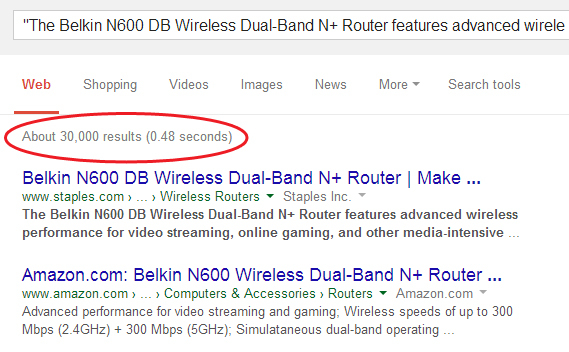 Take the content that exists on the web for the Belkin N600 Wireless Dual Band Router as an example. The Belkin N600 DB Wireless Dual-Band N+ Router features advanced wireless performance for video streaming, online gaming, and other media-intensive applications. Multiply that by the number of hits these sites get, and you can quickly see how many eyeballs this content reaches. 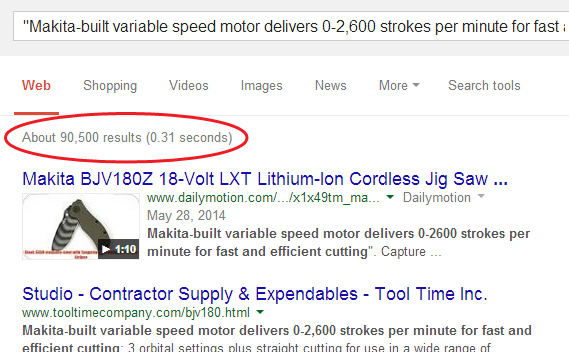 Bear in mind, again, that Google SERPs display only a fraction of the total number of results. This content does not come anywhere near our best practices for an introduction, and it gives us 90,000 hits! Given all that exposure, if I were the merchandising manager of this product, I’d make sure that every piece of content affiliated with this product was optimized for conversion. That task may sound daunting when you consider the large number of retail outlets and distributors that can carry your product. But it means little more than creating three unique pieces of content: one for your website, one for your leading online marketplace (such as Amazon), and one basic description your account managers can use for their new item setup forms. If you optimize your descriptions for these pieces of content, you’ll successfully control the vast majority of information online consumers see. And as I mentioned in the first post of this series, the introduction of enhanced content should include the name of the product, what it does, and how it will benefit the consumer. The butterfly effect dictates that first 150 words you associate with your product will spread far beyond the sites you control. Choose your words with care. Editor’s note: This post was originally published on 10/12/2011 at content26’s old blog, content26blog.dev. For this update we made minor edits and added a link or two.